Description - Spend more time with your friends and family and less time with your lawn equipment with our San Dimas Elite Turf Rolls in your yard. These artificial turf rolls are the perfect landscape turf for any front or backyard and are durable enough to be used as playground turf for both commercial and residential use. 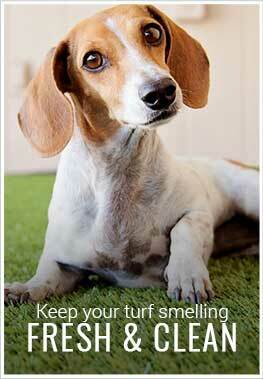 This plush and thick fake grass is also very comfortable underfoot and is great as pet turf. So no more pokes from grass, rocks, and other objects that are commonly found in natural grass. Virtually maintenance free, a 15-year warranty backs our San Dimas Elite Turf Rolls. Weight – .580 Lbs. per square feet. Recommended Uses – Our San Dimas Elite Turf Rolls are the perfect artificial turf for any front or backyard and are great as turf for pet areas, as playground turf, as turf for events, as pet turf for doggy day cares, and much more. The San Dimas feels higher quality than other options I had seen at local stores. I would recommend ordering samples to you can see and feel it before making the big decision but trust me, you can't go wrong with the Elite.